Older and wiser. Those are the words that come to me as I look at the charts for the New Moon of December 11—the current lunar cycle that ends this week—and the next New Moon of January 9. Right now, I am having a hard time believing that we are still wrapping up the lunar cycle that began when the Sun was in Sagittarius. Now that the Sun has moved well into Capricorn, those Sagittarian good times feel like so long ago. The shift from Sagittarius to Capricorn is large. It is the same contrast held by the two planets that possibly influence our lives most: Jupiter (ruler of Sagittarius) and Saturn (ruler of Capricorn). Jupiter is the expansive part of us, the part that hopes and believes. Saturn is the sober part of us, the part that judges and holds accountable. Alone, either of these viewpoints can stagnate our growth. But the synergy between them, the contrast and conflict that these two have with each other, creates an environment for change and progress. So, in a sense, after experiencing the shift from the Jupiter season of Sagittarius at the beginning of this lunar cycle to the Saturn season of Capricorn in the last half of this cycle, I feel that I’ve gone through a lot. I feel older and wiser. Do you? The week ahead has its share of twists and turns, asking us to be adaptable and adept at change. Adaptable and adept just may be the guiding concepts of the year ahead, which is heavily influenced by planets in the mutable signs. As I think about it, change may be too big a word, perhaps the tone of the year ahead is more about mutations—small evolutionary steps of adaptation. What do you need in your toolbox for adaptation this year? The mutable signs offer suggestions. From Pisces (mutable water): be fluid and pay attention to your own emotional needs, not just those of others. We will discover we are more connected than we thought and we need some ways to manage that reality. From Sagittarius (mutable fire): notice what inspires and reenergizes you. With Saturn in this sign, energy may flag. What kindles your spark of joy? Practice that. From Virgo (mutable earth): honor your work and the work of others. Make like the Hermit and seek the illumination that comes from solitude. Cultivate badass discernment. Not everything is worth the worry. From Gemini (mutable air): open-mindedness is a gift to the world. Take this gift seriously, we are going to need it. So back to the twists and turns. Mercury stations retrograde at 1 degree Aquarius on January 5. There may be more disruption to this event than usual because Mercury is also square Mars in Scorpio at the same time. Mercury retreating back into Capricorn has a heavy mission. It will contact Pluto in Capricorn and square Uranus in Aries two more times before it completes this retrograde cycle. Conflict and reactions to change are on the agenda. Jupiter also stations retrograde this week. It has made it all the way to the 23rd degree of Virgo and will spend the next 17 weeks retracing those steps. We get to create new assumptions about this sign. Yes, it does have a problem with perfectionism, but Virgo is also the champion of the worker. Let’s increase the minimum wage for all workers. In May, when Jupiter turns direct again, we could start to see real movement in this direction. This week, Venus in Sagittarius contacts Neptune in Pisces and Saturn in Sagittarius. Perhaps we learn to treat each other with more respect as we notice our differing points of view. The lessons may not come easily, however. Another tricky influence this week is the Sun in Capricorn conjoining Pluto and squaring Uranus. Don’t give up on the revolution that restores vitality and honors all beings. We may feel despair even as we engage once more in creating the world we envision. Monday, January 4. The side of Scorpio that does not suffer fools is called into action. The Moon in this sign could easily provoke the Scorpio nature in all of us. This week has some rough edges to it, and the general vibe may be that we are fed up. That dissatisfaction could be useful. Dig down and make a change about something really bugging you. The trine between the Moon and Neptune in Pisces may help us be a little more graceful if we know we can address frustrations and still come from the heart. Tuesday, January 5. Mercury at 1 degree Aquarius stations retrograde while squaring Mars at 1 degree Scorpio. Perhaps this change in direction will be unsettling. Mars is strong in this sign and infuses the day with a passion to get underneath our motives and emotions. Perhaps, Mercury takes up this charge and opens the door of discovery through all the usual mishaps and shenanigans that Mercury retrograde offers. In other words, when losing your keys, experiencing technical difficulties, miscommunications, and transportation delays take those moments as an opportunity to learn something deeper about yourself. Getting to the bottom of things releases life and power. To add to the intensity, the Sun in Capricorn conjoins Pluto. We will see the shadows more clearly. The square between Venus in Sagittarius and Neptune in Pisces adds another flavor to the day. We might not have the clarity we wish for as we negotiate relationships. Crossed wires and confusing messages invite us to feel more than understand what is going on. Turn on your psychic antenna. January 6 — Balsamic Moon: Surrendering. This lunar cycle began in Sagittarius. The Moon returns to that sign once more in this lunation to ask us to reflect upon and surrender the experiences and insights of this cycle. In this week’s introduction, I noticed that I felt older and wiser since beginning this lunar cycle, not because I’ve really attained wisdom, but because I feel like I’ve been through the gamut between hope and despair. Surely that range of experience contributes to some wisdom, right? The Moon, Venus, and Saturn form a tight cluster squaring Neptune. Ideals could be high but clarity low. Watch out for certainty. If we know beyond doubt that our beliefs are the true ones, then we are probably wrong. Better to be curious. What do I feel certain about? Why? What are the consequences of that “truth?” Could the outcomes be improved if I changed what I believe? Thursday, January 7. Work is important. Workers’ rights, the right to work, the quality of work are important. Jupiter in the worker’s sign—Virgo—stations retrograde while conjunct the North Node of our growing edge. We could think of this as the apex of Jupiter’s year-long transit of this sign. What is it about? Virgo is an industrious sign. We get to be industrious about making our work lives better. How do you honor your work and the work of others? What must we demand for our workers’ rights? All Virgo issues are strongly felt today. The Moon in Sagittarius will square stationary Jupiter as well. This is a moment to align our values with our work. It might not be easy, but it is valuable. The square between the Sun and Uranus supports revolutionary zeal of all kinds. Friday, January 8. Yesterday’s influences apply to today with the addition of more energy to commit to the changes we want. The serious tenor of the day comes from the Capricorn influence. The Moon enters Capricorn and Mercury re-enters Capricorn through retrograde motion. In addition, Venus in Sagittarius conjoins the ruler of Capricorn, Saturn. Mercury has serious business this retrograde cycle. We get to review, reflect, and readjust to the demands on our lives. These demands span the personal to the collective. What do you demand? Resolve is strong, but with this Mercury influence, we will have to be creative about accomplishing our goals. 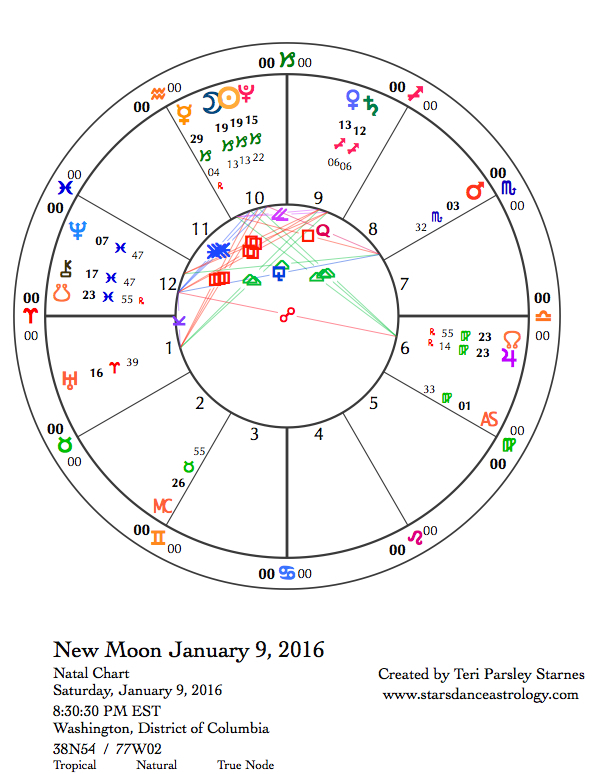 January 9 —New Moon: Beginning. The New Moon is a beginning—a chance to start anew. I suggest you consciously invoke this quality of a new start because the day might just feel like the same old same old. The last few days of the previous lunar cycle included moments of intensity and pressure. Mercury and Jupiter stationing retrograde created uncertainty. Transits involving Saturn and Capricorn lent a serious, perhaps pessimistic tone to the week as well. All of those influences are still present in the chart for the New Moon in Capricorn. It may feel like you’ve just woken up to the sober reality of the year ahead, and you have work to do. For some, this can feel exhilarating, for others, not so much. This is true of Capricorn/Saturn endeavors: at the beginning of the journey up the mountain, it can feel daunting. Yet, if we just put one foot in front of the other, at some point, we realize that we’ve got a new perspective. We enjoy the view from the vantage point of dogged effort. There is a reason to keep going. We are not at that vantage point yet. Right now, it is about beginning, knowing that the climb will take hard work. The Sun and Moon are conjoining Pluto in Capricorn at our beginning point. Pluto has been in this sign since 2008, when the stock market fell due to the unscrupulous abuse of money markets. Pluto came roaring into Capricorn with the agenda of exposing toxic governments, hierarchies, and authoritarian systems of all kinds. Uranus began squaring Pluto three years ago and it seems we’ve awakened to the dire need to change the status quo. We don’t need to question the need for change, or what needs changing. We don’t really need to question how to make these changes, either. What we most need is a commitment to climbing the mountain, step by step. A presidential election is coming up this year in the U.S. As the year turns from 2015 to 2016, it is time to ensure that the election reflects the changes we want, even if the candidates don’t. Perhaps this is the time you and I get more involved. Jupiter just stationed retrograde conjunct the North Node in Virgo. Jupiter will stay conjoined to the node for the next 12 days or so. The North Node leads us to the next edge of growth. In Virgo, we are cultivating the edge of well-being, service, work, devotion, and discernment. Because Virgo is pragmatic rather than flashy, it can be overlooked. Don’ t do that. We need just these qualities to keep climbing our mountains. Venus and Saturn are conjoined in Sagittarius. This mutable fire sign is undergoing an initiation in fire tending. Saturn encourages us to create solid containers for our fires. Venus reminds us that beauty and love are important components of a fire that sustains. Dissolution is happening with Neptune in Pisces looming large over the other planets in mutable signs. We don’t need to rely on faith alone to climb the mountain, but there is certain amount of surrender involved as we look to the mountaintop. This influence waxes and wanes throughout the year. Sunday, January 10. Where is your sense of humor? 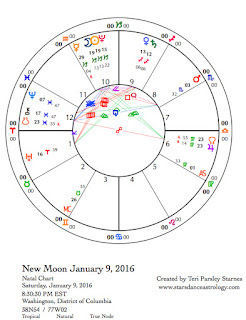 The influences of this Capricorn New Moon mixes with Mercury’s shenanigans to shake us up. Although it is true that Capricorn is deadly serious, this sign also has the best sense of humor. What we sometimes call gallows humor. Find that bitter humor today as Mercury and the Moon conjoin to mess up our plans. When the Moon moves into Aquarius, visionary energy is strong. A square between the Moon and Mars tonight might stir up differences in approach for creating the future we are dreaming.